The first modern city: In the 18th century Manchester was the cotton making capital of the world. The city was one of the breeding grounds of the industrial revolution and its entrepreneurs and industrial tycoons endowed it with museums, galleries, theatres and libraries as well as outstanding civic architecture. A devastating IRA bomb in 1996 created the need for city center regeneration resulting in a new, dramatic 21st century cityscape. Music central: Manchester is an innovative music city producing leading indie, pop, folk, punk, rock and dance groups. An exciting place to make and hear music. Central Manchester has a population of about 440,000 in a Greater Metropolitan Area of more than 2 million. Manchester is located in the northwest of England, about 30 miles from Liverpool and 204 miles from London. 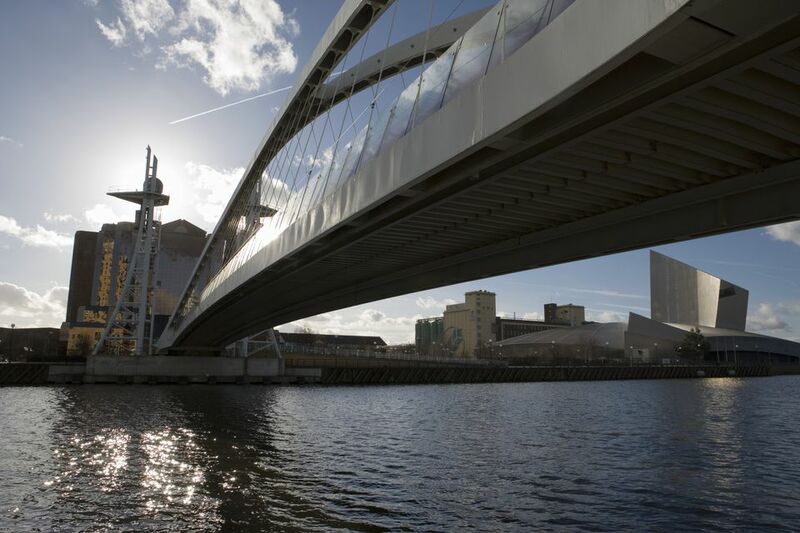 It is linked to Liverpool and the sea via the 19th century Manchester Ship Canal which terminates in the Greater Manchester Borough of Salford. Manchester, like much of England has a moderate climate that never gets very hot but rarely falls below freezing. In July the mean temperature is 61° and in January it is 39°. Snow falls occasionally in January and February. Fall and winter are the wettest times of the year but visitors need to be prepared for rainfall in any season. Manchester Airport is the UK's most international airport outside of London with many transatlantic connections. In all, 100 airlines fly to Manchester from about 200 destinations. Trains to the city center take about 20 minutes and taxis cost less than £20. Frequent trains between Manchester Airport and Manchester Piccadilly station in the heart of the city take less than 20 minutes and cost less than £3. Trams:Metrolink operates trams throughout the city center, connecting the main train stations and most visitor attractions. Free Shuttle:The Metroshuttle is a free city center bus service with three, color-coded circular routes that connect the main train stations and car parks as well as many bus and tram stops. The orange route runs every five minutes while the green and purple routes run ever 10 minutes. Buses: Transport for Greater Manchester operate buses. Check their website for schedules, routes and fares. And lest we be accused by list makers of forgetting, The Bee Gees, though they started musically in Australia, were born in Manchester. Watch and buy at the Manchester Craft and Design Centrea tempting combination of artists studios and retail shops. Give power to the people at the People's History Museum, the only museum devoted to the history of working people. Admire international architect Daniel Libeskind's new Imperial War Museum of the North, another masterpiece from the chief designer of the new World Trade Center in New York. Chill out with classical music. Take in a performance of Manchester's renowned Hallé Orchestra at its modern glass lantern of a venue, the Bridgewater Hall. Try the new Trafford Centre about five miles from the city centre. It numbers the first Selfridges outside of London among its 230 shops. Bring good walking shoes -- there are three miles of marble and granite boulevards full of shops. And if you're heading for Manchester in the winter, check out the great, city center Manchester Christmas Markets. There are five of them and they go on for nearly a month. Cloud 23 is in a Hilton Hotel, high up in the Beetham Tower, the tallest building in the UK outside of London. The views from floor to ceiling windows are great. The drinks are nice too.